THE VILLAGE OF ENNISKERRY may be considered the threshold to the beauties of Wicklow; it is picturesquely situated in the lap of gently sloping hills, its white cottages contrasting cheerfully with the bright verdure of the foliage by which it is partially screened. 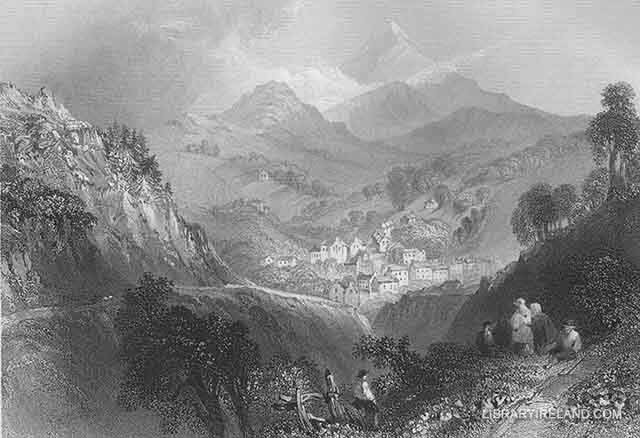 At a short distance, on the rise of the hill above the village, is the entrance to the demesne of Powerscourt, the property of Viscount Powerscourt, which for beauty and variety of scenery can scarcely be equalled anywhere. It would be impossible for the pen to convey an adequate idea of the numerous points from which prospects of unrivalled magnificence may be obtained; but, perhaps, none are excelled by that which is gained shortly after entering the grounds. "Here," says an observant tourist, "as we approach the house, the first break of scenery towards the south is inconceivably grand, soft, and various. Mountains, often cultivated high towards their summits, and sometimes rudely majestic in the unaided tints of nature, form the impressive background at a happy distance. The undulating tracts which lie between that range of mountains and the lofty ridge on which the spectator is placed, comprises the rich woods and plantations on the demesne of Charleville." Amidst the romantic scene, the River Dargle pursues its devious course, gliding, rippling, or foaming through a lovely glen towards the ocean. It is conjectured that the Dargle has acquired its name from the oaks which adorn it. Dar-Glen, signifies "Oak Valley," which might easily have been corrupted into Dargle.